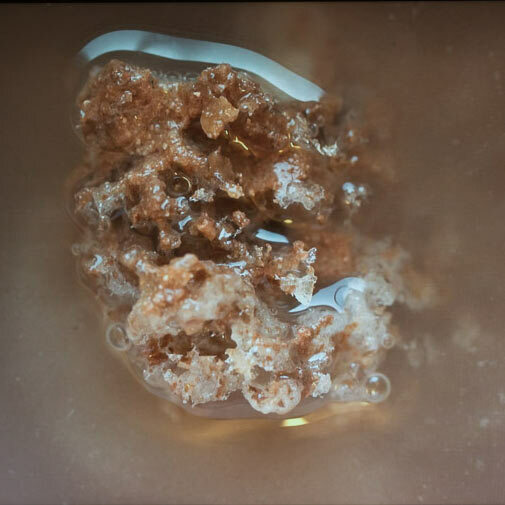 Cinétracts is made up of a number of different works that Sam Nightingale produced for Spectral Ecologies, an ongoing research project and exhibition that explores the changing technologies of cinema as a method for creating and perceiving the worlds that surround us. The research project is undertaken by Bridget Crone, Sam Nightingale and Polly Stanton. In the large body of works Nightingale has grouped together under the title Cinétracts, he retraces (or re-performs) the journeys taken by Nulty’s Pictures using photography, video, archival material and through walks and public discussion. 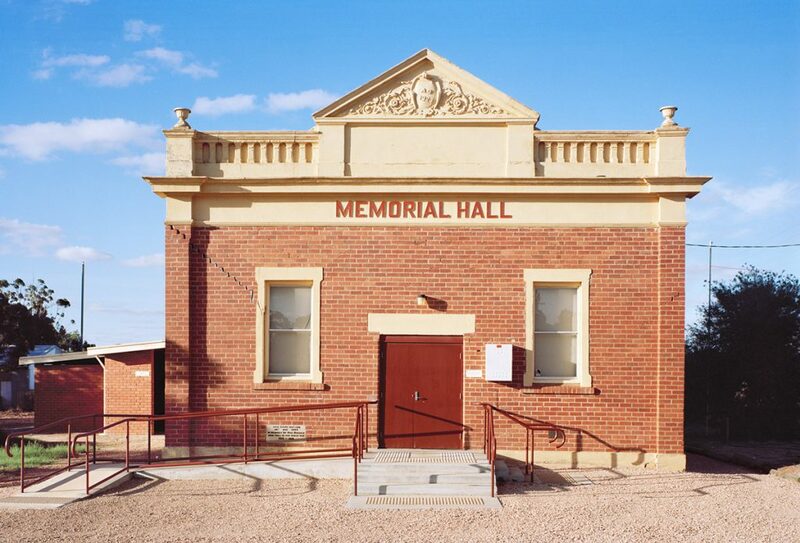 Nulty’s Pictures were a travelling cinema circuit that operated in the early twentieth-century in the Mallee a remote and semi-arid region of Victoria, Australia. In making the work, Nightingale visited almost every location in which Nulty’s Pictures projected a film, documented each site as he found it. 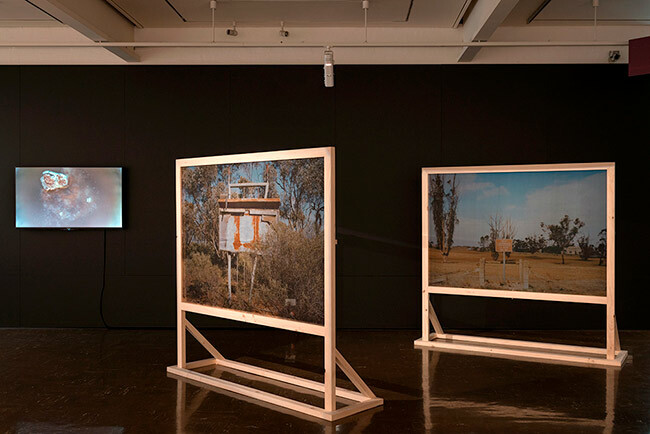 However, significant to the work is the way in which the Nulty’s story operates as a means for Nightingale to see, engage with and experience the Mallee: it becomes a frame or a kind of technology for both seeing and experiencing (and limits of not-seeing and not-experiencing). I followed an image of a potential future born long before my time in a country that was never mine. I followed a track of the picture showman to a story I could never know. 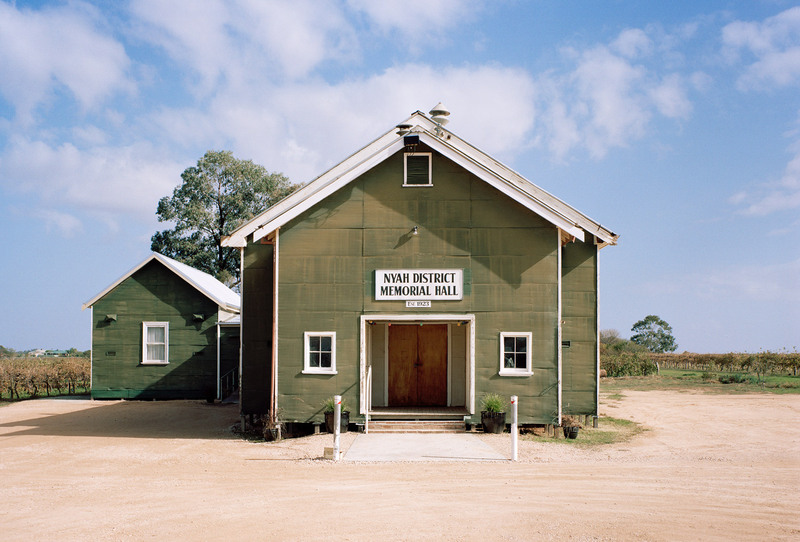 Nyah and Walpeup Public Halls, Cinétracts (2017). The title of the work, Cinétracts, highlights the process of Nightingale’s physical and archival journey through the Nulty’s story; the title’s play on the word “track” and “tract” refers to both the physical movement of making a track or following one, as well as the delineation of a large area or tract of land and its bodily equivalent (the digestive tract), and the textual equivalent that can be found in the passage of an idea through the publication of a tract (noun). 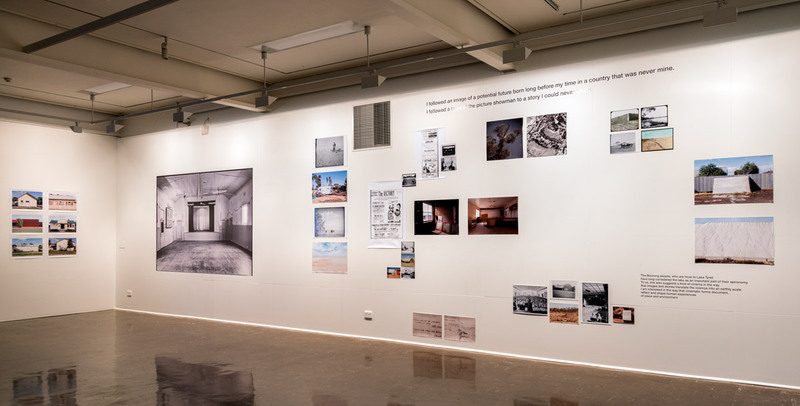 'Spectres of the Mallee', Cinétracts (2017): wall containing assorted archival and contemporary images, objects and notes (various dimensions). Spectral Ecologies, Mildura Arts Centre, 2017. Nightingale’s journey can be considered a type of performance or re-enactment because he not only seeks to make visible these lost spaces of cinema through his photographs and videos, but also to re-inhabit and experience the inhabitation of these spaces. His, then, is a performance geared towards re-experiencing these sites not as something that has past but to experience that past in the present by exploring how an intangible aspect – a feeling, a sense of something unseen – something spectral. 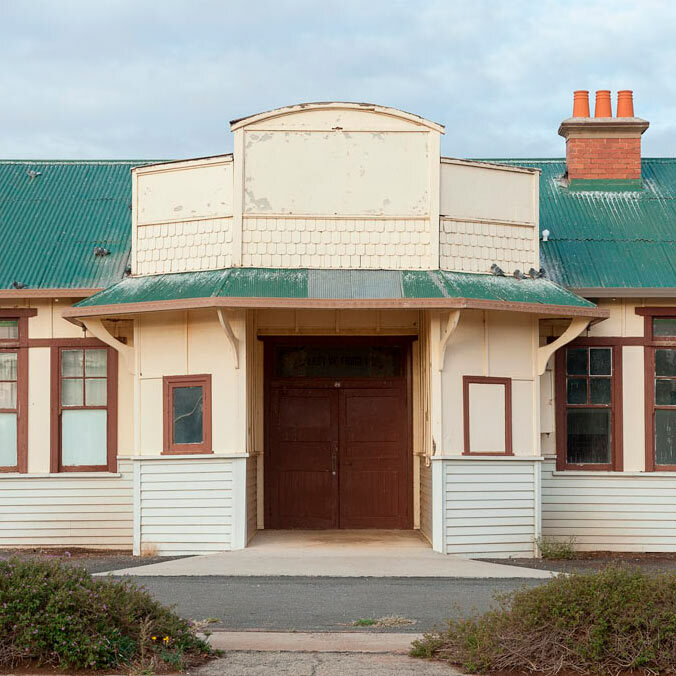 He follows the choreography of film’s movement across the Mallee, and in traversing alongside the tracks of Nulty’s Pictures he makes them visible, becoming closer to their story. 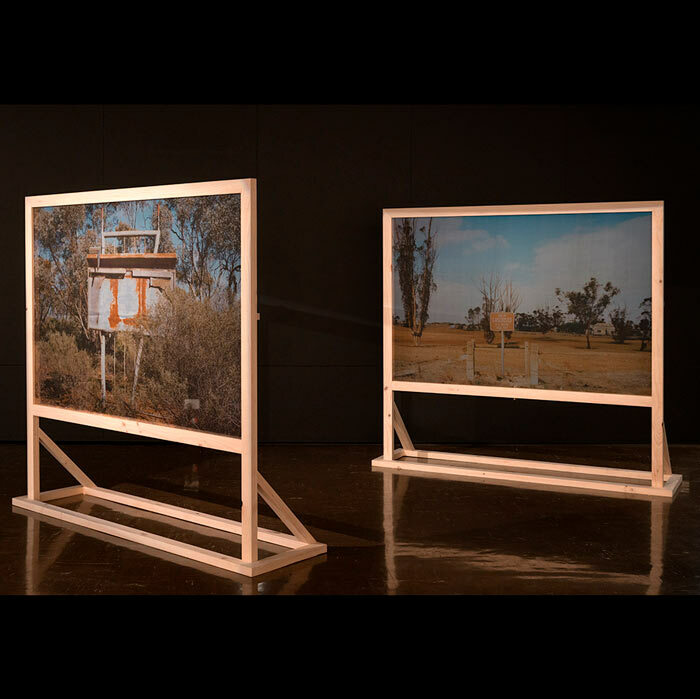 Left: Cinétracts (2017): photographic images printed on silk and mounted on a series of wooden frames reminiscent of drive-in screens. 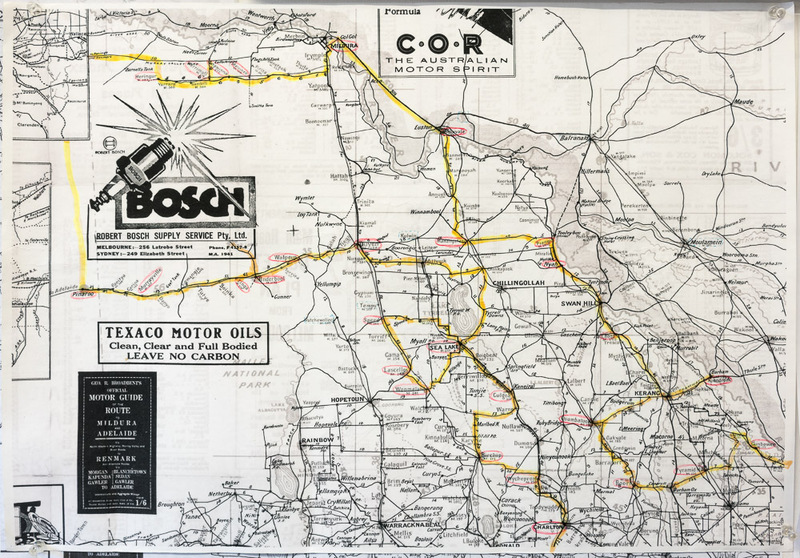 Right: Map indicating Nulty's Pictures cinema circuit, highlighting the route traced during the fieldwork in 2016 for Spectral Ecologies. 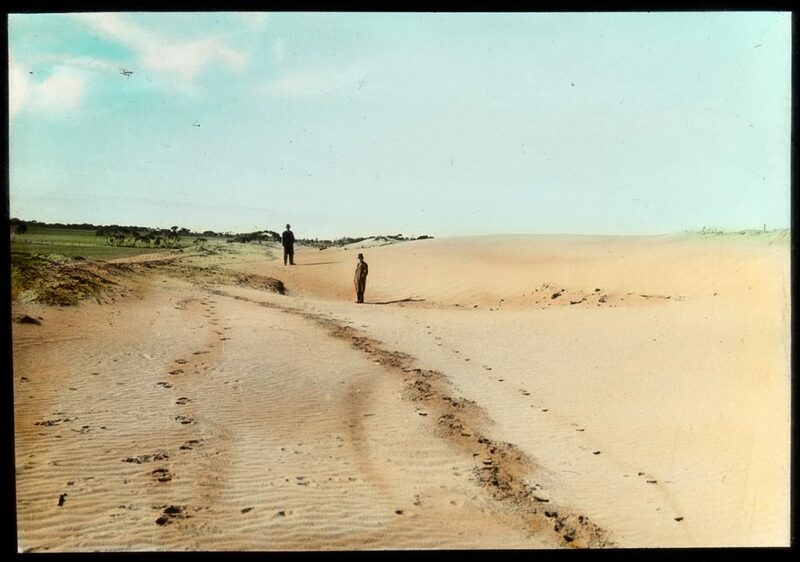 The tracks we followed across the Mallee have largely to do with cinema, and we imagine an equivalence between the track formed by a traveller across the land, and the passage of film as it runs through a projector, both creating a path for images to follow. 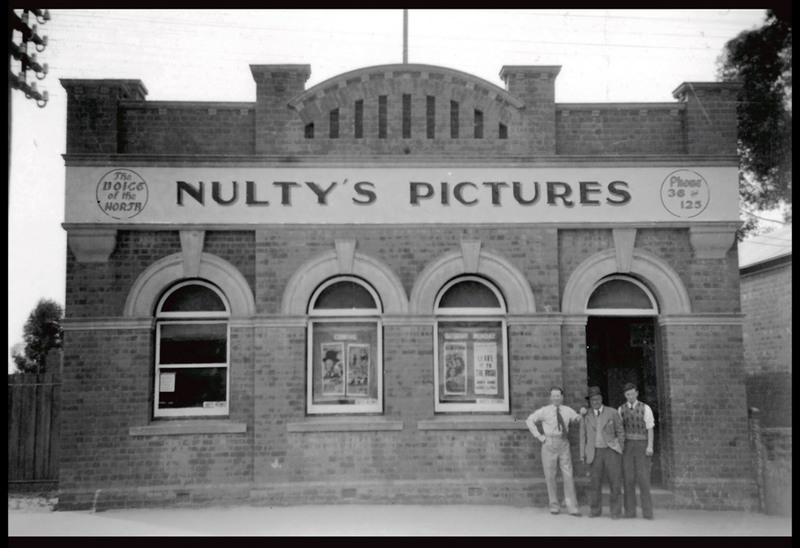 Jim, Mick and Eric Nulty standing outside the film office in Ouyen, Victoria. ca. 1930s. Courtesy of Nulty Family. Desert and sandy regions (ca. 19001940): Glass lantern slide, hand coloured. Author/Creator: Victoria State Rivers and Water Supply Commission photographer. State Library Victoria Collection. 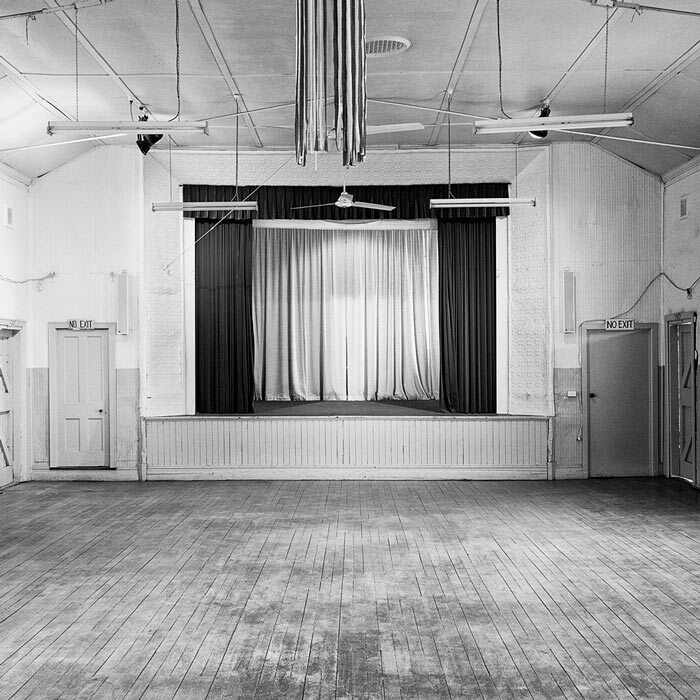 Cinétracts was made possible with generous support from Mildura Arts Centre.